This event will help you 'ReThink' your spend management initiatives so that you become faster, leaner, smarter with the delivery of optimised procurement and payables processes, delivering greater bottom-line value for you. 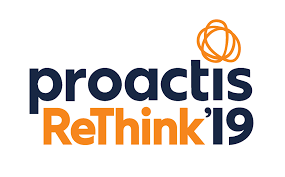 Proactis ReThink '19 UK will include dynamic keynote presentations, best practice case study and solution breakout sessions and more. The day will cover a range of procurement, purchase-to-pay, accounts payable, and supplier engagement topics. The agenda will be published in due course. Learn how you can transform the way you buy and sell all types of goods and services. Discover new ways of doing more with less by eliminating wasted time, money and talent. Explore market trends, best practices and how to drive cost savings, operational efficiency and control. Hear how our customers have led transformational change within their organisations. Connect with Proactis, our customers, partners and your peers. An Agenda will be released in due course. Watch the ReThink '18 Highlights Video.